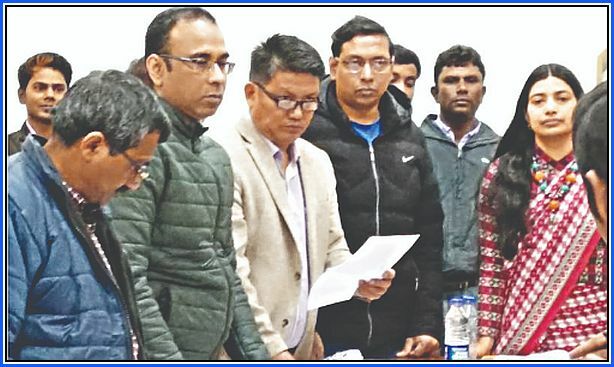 Darjeeling: Swaraj Thapa, who had resigned from the Gorkha Janmukti Morcha (Bimal Gurung faction), filed his nomination from the Darjeeling constituency on Tuesday. Incidentally, GJM (Bimal faction) and the GNLF have extended support to the BJP. Following the announcement of the name of Raju Bista as the BJP candidate for the Darjeeling constituency, Thapa had tendered his resignation from GJM (Bimal faction). Following the filing of nomination, Thapa told media persons: "Niraj Zimba, the GNLF Spokesperson, had called me up and told me that the GNLF had recommended my name to the BJP for the Darjeeling constituency as the fittest candidate. I have decided to contest the election so that people get a strong alternative." Thapa, who was a close confidant of Gurung and served as an Advisor at the Gorkhaland Territorial Administration, stated: "BJP has fielded a candidate from outside. People are unhappy with the choice. I am sure I will be able to do more than him." The Gorkhaland issue would be Thapa's poll plank. "In an electoral process, people should be given a choice of candidates. I am sure I can do much more for the issue than the previous BJP MPs who have won from this constituency," said Thapa. Harka Bahadur Chettri, the Jan Andolan Party president, also filed his nomination on Tuesday. "We had tried to bring the regional parties from the Hills together and field a consensus candidate. When this fizzled out, we decided to contest," Chettri said. Though the main agenda for Chettri's party is the Gorkhaland issue, he stated that other issues like drinking water and minimum wage for tea garden workers will also be taken up by the party. "I will carry the voice of North Bengal to the Parliament," added Chettri. 21 candidates have filed nominations from the Darjeeling constituency. Tuesday was the last day of filing nomination. The constituency will go to polls on April 18. Swaraj Thapa, who had resigned from the Gorkha Janmukti Morcha (Bimal Gurung faction), filed his nomination from the Darjeeling constituency on Tuesday. Incidentally, GJM (Bimal faction) and the GNLF have extended support to the BJP.